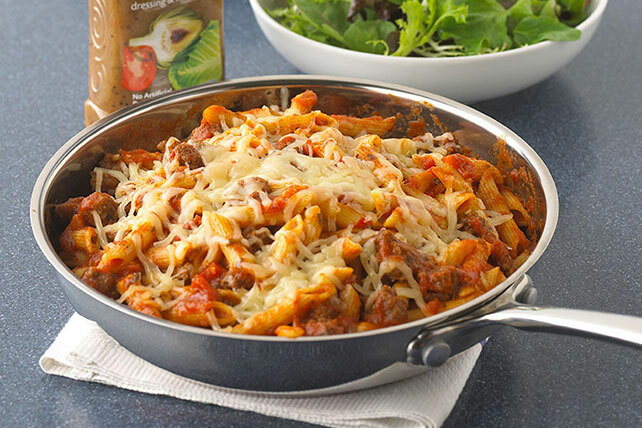 One is the loneliest number—and that's a good thing when it's the number of pans you have to clean after making this savory Penne Pasta Skillet! Brown meat in large skillet on medium heat; drain. Return meat to skillet. Add pasta sauce and water; mix well. Stir in pasta. Bring to boil; cover. Simmer on medium-low heat 16 to 18 min. or until pasta is tender; stir. Top with cheese; cover. Cook 1 min. or until cheese is melted. Garnish with chopped fresh basil or parsley just before serving. Prepare using your favorite small pasta shape.